VANCOUVER - A woman accused of human trafficking and forcing a domestic servant to work in virtual servitude in her multimillion-dollar West Vancouver home simply brought a family friend from Tanzania to Canada, says her defence lawyer. The trial began Wednesday for Mumtaz Ladha, accused of luring the 21-year-old woman to Canada with the promise of a job in a hair salon, only to force her to work up to 18 hours a day, seven days a week without pay in her mansion in the swanky British Properties neighbourhood. But lawyer Eric Gottardi said the alleged victim was no servant and did not work in the Ladha home. "This person was a companion who came with Mrs. Ladha and basically was treated like a member of the family," Gottardi said outside the court following the first day of the trial. "The issue of work and what is work and who was doing what around the house — those will be some of the issues at trial." The woman came to Canada in 2008, and fled to a women's shelter in June 2009. Laurie Parker-Stuart, a counsellor at the shelter, described in B.C. Supreme Court meeting the woman for the first time. "She was under stress," Parker-Stuart testified. She had no passport, and did not appear to have any connection to anyone, she said, adding that the young woman spoke Swahili and broken English. "She came with the clothes she wore. She really didn't have anything," Parker-Stuart said. The shelter put her in touch with West Vancouver Police for help retrieving her passport and belongings, and Const. Kelly English testified that she went to the Ladha home. The passport was not there, she was told, and she went back the next day. English described the home located in one of the wealthiest neighbourhoods in Metro Vancouver, overlooking the ocean. The home's assessed value is listed at more than $4 million. The officer was led to a room about one metre wide, located off the pool room on a lower floor. The room had a bathroom en suite and a cabinet with a television on top. There was no window. English filled a garbage bag with clothing and shoes, and left behind enough to fill another garbage bag, she said. Defence lawyer Tony Paisana asked the officer what she observed about the alleged victim when they first met. "I recall she appeared to be in good health," English testified. "Right. And she did not appear distressed at that time?" Justice Lauri Ann Fenlon, who is hearing the case without a jury, heard the shelter received a screaming phone call from Ladha's adult daughter a few days after the alleged victim's arrival, after police handed over their file on the case. Zara Ladha requested a copy of the report, Staff Sgt. Graydon Findlay testified. "She advised me she was concerned that her mother, Mumtaz Ladha, who was at that time in Tanzania, had been contacted by ... (the alleged victim's) family and advised not to leave until they learned the whereabouts and the health of their daughter," he said. "So, essentially, Zara was conveying the fact that her mother had been threatened?" defence lawyer Eric Gottardi asked. The department provided a copy of the report, which included — at least — the telephone number for the shelter. The accused's daughter called, "a very angry, loud call," Parker-Stuart told the judge. 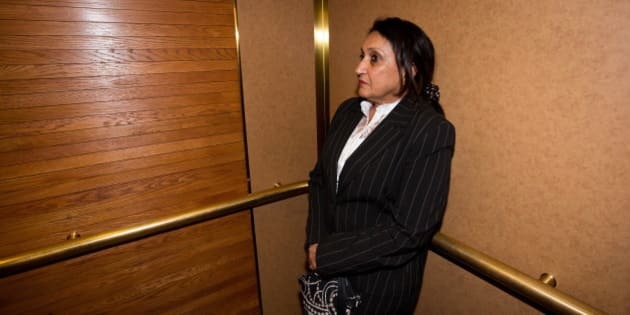 Dressed in a black pin-striped suit, her hair pulled back in a pony tail, Ladha sat attentively in the prisoner's box after the judge declined a request to allow her to sit at her lawyer's table. The alleged victim is not allowed in the court until after she testifies next week. Gottardi asked the shelter counsellor if she recalled police telling her the alleged victim could potentially obtain an extension of her immigration status if she were a victim of human trafficking, and whether she, in turn, passed that information onto her. "In a really limited form. You realize, I don't speak Swahili," Parker-Stuart said. A human smuggling charge is not proceeding, after a previous B.C. court ruling left the Criminal Code charge in limbo. Ladha, 57, pleaded not guilty to one count of human trafficking, two counts of misrepresentation and an employment violation under the Immigration and Refugee Protection Act. Caroline Raymond, a retired officer who was the RCMP's Human Trafficking co-ordinator at the time, testified she interviewed the alleged victim several times. The defence and Crown both asked about threats toward the alleged victim. "Mumtaz and Zara do not threaten to send the victim back to Tanzania," Raymond read from her notes. "On the contrary, they kept telling her to stop crying like a baby and to get back to work, back in Canada, as she needed to work a little longer for them to repay Mumtaz the cost of bringing her to Canada."